The annual circumnavigation of Prince Edward Island attracts sailors, storms and liars. ​Naiad at hull speed presses out of Charlottetown Harbour. Sailing Canada is no longer in publication. I have spent some time in tracking down who has the rights to the work and talked to several people in that regard. No one was quite certain who held the ultimate authority on the publishing rights and all concerned felt there would be no problem in reproducing this article here. If there is any indication to the contrary, please contact the webmaster. Prince Edward Island and a rhumb-line course around it of approximately 350 miles.Canada, despite its yachting traditions and extensive coastline, is shy of indigenous off-shore races. The Victoria-Maui is the longest, the Marblehead-Halifax the most prestigious and the Swiftsure probably the most interesting. This year the fourth Round the Island Yacht Race — Prince Edward Island, that is — was held and it looks as though a tradition is being born: one that has all the potential for a major yachting event for the East Coast. 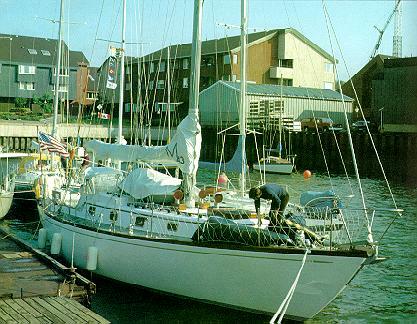 In 1978, Allan Holman sailed his Contessa 26 around Prince Edward Island and saw the possibilities for a challenging off-shore race. 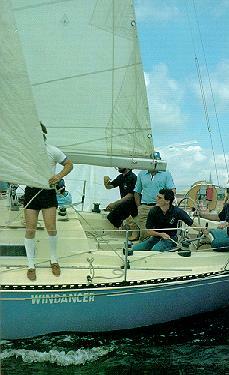 A race committee was struck in the Charlottetown Yacht club and in 1979 the first race was held. The idea was a good one. The course at 350 rhumbline miles was long enough to challenge boats and crew, the weather conditions unpredictable enough to reward good seamanship, and the enthusiasm of the club, committee and local agencies high enough to support the considerable preparation that goes into organizing a race of this sort. 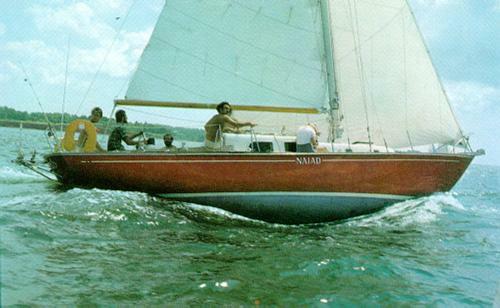 Come the 1982 race your editor, always ready to put the cause of yachting jounalism before considerations of personal comfort, agreed to join three other spartan-minded sailors in tackling the course in a 24 foot Shark. Before you think that four and a half days offshore racing in a Shark may show more enthusiasm than good sense, let me say that the boat had been rigorously prepared for the event and every member of the crew was a thoroughly experienced sailor. Under other circumstances — an ill-prepared boat with a novice crew —the plan would be ill-advised. Every year the race has run into extreme weather conditions that have challenged the fleet. This year was no exception. As a result there was a lot of club-house discussion about admission policies, especially as they govern boat size. General regulations for entry approximate to IOR rules but fall short of requiring life rafts. VHF and life-lines are mandatory and there is a minimum of four crew members per boat. Other regulations are dictated by common sense and Ministry of Transport requirements. But what about boat size? Dave Mosher's Windancer setting up at the start. Forgive a personal comment delivered with some warmth. There seems to be a tendency these days to assume that bigger is safer. Barring perhaps the wave conditions that characterize the Screaming Sixties, it is a fallacy to equate safety with size. Safety is a function of design, manufacturing integrity and seamanship. Indeed, as was recently pointed out by Lin and Larry Pardey (of Serafynfame), a well-found smaller boat is easier to handle in foul weather on account of the smaller components involved and the shorter distances required to go to get things done. Comfort may be a premium, but safety —no. The tendency to condescend to the small boat offshore is dangerous largely because it suggests that bigger boats are inherently safer and therefore can be relied on as a substitute for competent seamanship. Back to the race. There were thirteen entrants, ranging in size from 22 feet to a Mason 43, up from San Diego. The gun fired at 1230, July 26th, and the clockwise circumnavigation of Prince Edward Island had begun. Conditions were fair with 15 knot winds to clear Charlottetown Harbour and spread the fleet on a course for Tryon Shoals. The bigger boats — the Mason 43, a C&C 34, 30 and 29 led the pace and crews had no reason to doubt the long-range forecast given at the weather briefing: "Winds light and variable. Fair." The race was shaping up as a beat to West Point with odds taken on courses to catch or avoid tides as they set fair or foul. Apart from spectacular lenticular cloud formations and a 30 knot line-squall, there was no hint of worse to come. The norhtern tip of the Island passed to starboard —for us at 0345 on our second day with 98.7 miles logged. Barry Himmilman's Mason 43 ready for the race after a long cruise up from San Diego, California.It was only after a long tack out to sea off the north-east coast of P.E.I. and a few closing tacks to the Rhumbline that we realized that the weather men had missed something in their crystal ball. A local depression of great intensity had developed over Moncton and was preparing to blow itself and all before it off to Labrador. We heard later that it had formed with no warning and was developed enough to pull part of the jet stream down to sea level. Being at sea level, we were made very aware of what this meant. At 1900 hours on the third day it got miserable with strong winds and driving rain — both fortunately warm. By midnight we were bucking heavy seas under jib and reefed main, and thinking the worst must have passed. But for the rest of the morning the winds increased until by 0800 we were one on one with a full gale. If you are not familiar with a shark you should realize that for its 24 feet it is not a big boat —shark-shaped, in fact, with narrow beam and low freeboard. It was conceived, though, by Geroge Hinterhoeller as a boat well equipped to take heavy weather. Teh sharp entry slices rather than slams and the long run gives speed when you need it. Below decks, though, is small. Under double-reefed main only, the tiller watch drove the boat up one mountain and down the next valley while off-watch suffered below. The boat was wet with spray but in those confused seas, some of which jumped to twenty feet, whe never once took water in the cokpit or showed any bad habits. The wind indicator had blown off and a certain crew member (uh-hm) was sick, but the boat itself felt as though she was there for the sport. ​Barry Himmilman's Mason 43 ready for the race after a long cruise up from San Diego, California. Naiad at hull speed presses out of Charlottetown Harbour.By midnight ofthe fourth day (July 29th), winds began to abate. The experience had been exhilarating but as one crew member, Dave McArthur said, "You learn a new humility in those conditions." An unquotable quote was uttered when a rogue wave was quartering our stern. He cricked his neck trying to see the top of it and quietly invoked the sanctity of the grand ordure. There was one partiuclarly memorable incident at the height of the gale. We had lost contact with the rest of the fleet and were hoping all were well found. Out of nowhere, the Tanzer 22 suddenly was there, smoking along on the opposite tack. A large wave came between us and he was gone. It was an extraordinary apparition but apparently they had a similar one at the same time. We rounded the East Point light at 1220 with winds down to fresh and were looking forward to a day to dry out. At two o'clock in the morning a second depression hit and all I can clearly remember is sharing the watch with Dave and tacking wildly back and forth off Souris Harbour against wind and tide in the pitch black against Force 7 winds, under double-reefed main for what seemed a whole night. Later, Bob Griffith, skipperand navigator, calculated we had actually made good five miles of course — and I though were barely in a holding pattern. A grand lady from Charlottetown, Bob Midgley's Camper & Nicholson 38, Keneskoonech.So much for the drama. The rest of the race was a hard beat on the nose with barely a free wind to give us a push. When we entered Charlottetown harbour after 458 miles and four and a half days, we popped the spinnaker for the first time and drove in at seven knots. The corse itself is challenging, the organization is competent and the local support enthusiastic. What the Round the Island Race needs is to gain the acceptance of the yachting community at large. Presently, it largely attracts boats from local waters with, this year, one boat from Toronto nad one up from the South. For the race to gain in stature and rputation a decision must be made to appeal to serious IOR rcers based south of the line as well as boats from Quebec, Montreal and Halifax. With PHRF and IOR categories and a thirty boat fleet, the Round P.E.I. Race could become a premier event on the sailing calendar. Without a deliberate attempt to raise the profile of the race so that yachts from other waters are attracted, the race will doubtless continue as a local event with both charm and challenge. In either event, let's hope that Liar's Night survives! Every year at Liar's Night — the traditional end-of-race celebration — crews of losing boats make the Tall Tale seem like a flimsy fantasy compared to the hardships and misfortunes they had to surmount even to finish the race at all —mutiny, piracy, shipwreck and extra-terrestrial sabotage. Naturally, all these calamities are consumately overcome but at the cost, alas, of the winning position. A bonus for organizers and contestants alike is that Prince Edward Island provides a beautiful and hospitable backdrop to the event. The Island Province is most attractive in mid-summer and a few days tacked on to the race time-tble would make for a great holiday. So, the serious racer, the Round the Island Race provides a fine opportunity for some solid offshore racing, but for that character inseparable from the sea, the creative talker, the spinner of yarns or the outright liar, the race is a must.